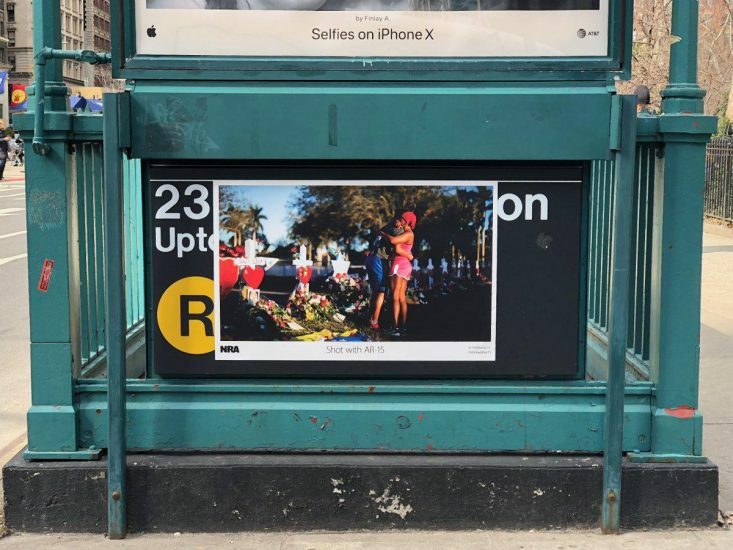 Starting on the 24th March, the day of March of Our Lives, a series of posters were plastered across Manhattan to call attention to gun violence. 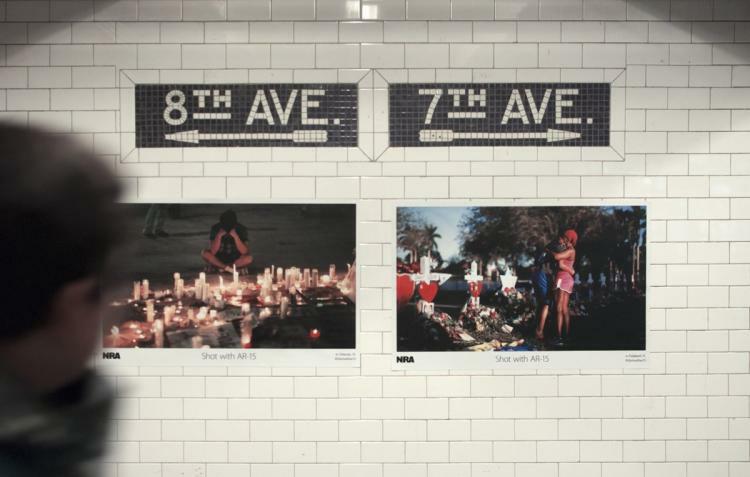 The guerrilla ads were created by two 26-year old School of Visual Arts students, Ji Kim and Andy Koo. They took inspiration from the Apple “Shot on iPhone” campaign, which showcased the quality of the iPhone camera and personal photography. 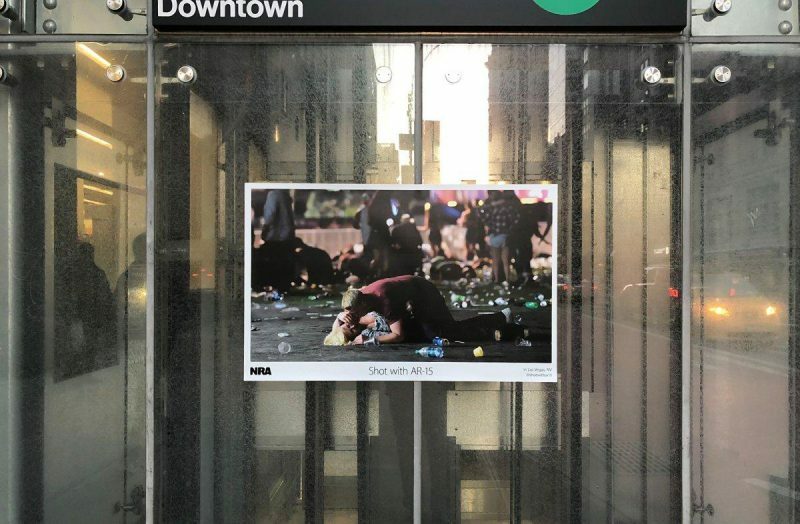 They have kept the campaign dimensions and fonts very similar but swapped the tag line to “Shot with AR-15”, replaced the Apple icon with the National Rifle Association’s logo and the images focus on devastating scenes of gun violence tragedies. Kim and Koo created 12 different designs, which they printed over 80 times. The images focus on people mourning victims of recent AR-15 rifle massacres at Sandy Hook Elementary, Marjorie Stoneman Douglas High School in Parkland, Las Vegas and Pulse Nightclub in Orlando. They now intend to expand the campaign beyond New York to other cities in the United States. São Paulo has a significant number of homeless people on the streets. Despite numerous public shelters, many have empty beds every night. One of the reasons: the homeless do not want to abandon their dogs, which are not usually accepted in shelters. Now, the new units accept and guarantee space for the pets, but unable to communicate this to people who did not own phones, TVs or were not active on social media, the beds remained empty, while hundreds of people continue to sleep on the sidewalks. To communicate this change to the homeless, São Paulo City Hall decided to create a new communication channel, with a direct impact. 5 different street artists, transformed the roof of viaducts, and underpasses, where the homeless people are usually found – especially at night before going to sleep –, in a direct and effective media, with the main goal getting those in vulnerable situations to have the opportunity to sleep with comfort, safety and dignity, without compromising their pets. JWT London created a billboard for KitKat that switched itself off in a bid to persuade people to “have a break” (get it?) from electricity. On 24 March at 8.30pm, million of people worldwide switched off their electricity for during Earth Hour in support of efforts to tackle climate change. To drive awareness of the “Switch off” campaign, the choclolate brand’s billboard, shaped life a KitKat finger, ‘snapped’ to break a circuit to turn off its power. The stunt was timed in concert with the lights switch-off on Tower Bridge, giving the illusion that it switched off the bridge’s power in order to reinforce the significance of the message. The signs of Human Trafficking are all around us, even on the streets we travel every day. To highlight this, the Los Angeles Commission for the Status of Women created a sign with a difference, asking the people of Los Angeles to look again and report Human Trafficking.